I've been using SurveyMonkey weblinks embedded into my Storyline courses because of SM's great reporting features, but find that it doesn't collate responses from multiple surveys (with the same exact questions) so we can get some overall results. Do any of you know of any product that can do this? No, I haven't heard of anything that does this. Why do you need to use multiple surveys if the questions are all the same? Maybe see if SurveyMonkey allows you to export the responses to a spreadsheet as you could probably combine them all pretty easily that way. Because the surveys are for different courses. So, I would like to know what the results are for CourseA, CourseB, CourseC, but I'd also like to know if overall, the respondents ALL felt that they could apply their knowledge (answer #6 collated for all of the courses). I just can't believe no one has ever wanted to do this - ???!! Sorry, I don't have an answer for you Victoria. I was hoping the approach of using a different 'collector' for each course might work, but it sounds like it doesn't. Good luck finding a solution! At my organization, we have all of the questions set up in a single survey. Then we've set up multiple collectors to differentiate which responses are related to which training (and trainer if it's an ILT). 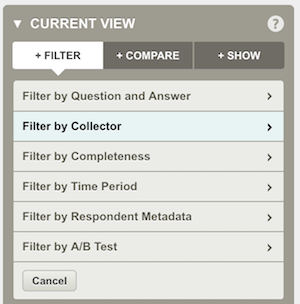 In the analytics section, you can view everything together or filter by collector. Can you draw reports from each collector as well? All I seem to get is the raw data and then I have to export it to Excel and manipulate it all manually. Have you found a quicker way? Then you get your normal analytics view but with a subset of responses. I checked and they do include the collector-id in exports if you wanted to do some advanced manipulation outside of the tool, but for my company, it hasn't been necessary. Thank you, Allison! I will give it a try and let you know how I go. "Yep. This is what it looks like if you're just using the Analyze ta..."
"Hi Victoria, At my organization, we have all of the questions set ..."